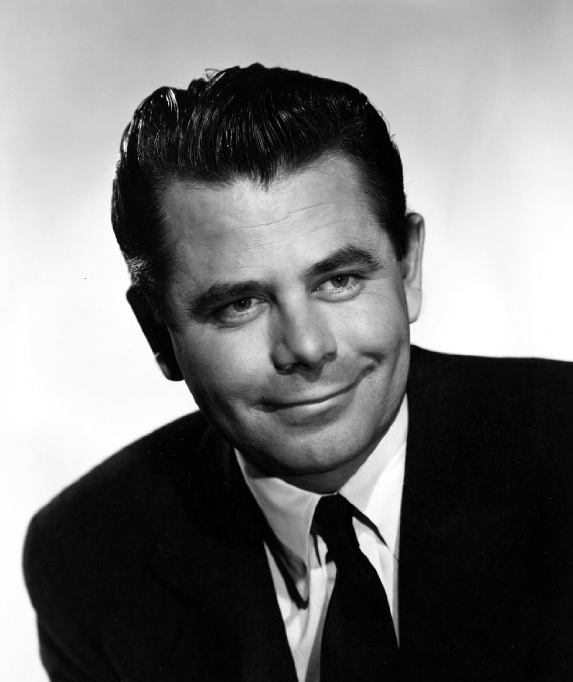 Glenn Ford (May 1, 1916 – August 30, 2006) was a Canadian-born American actor from Hollywood’s Golden Era with a career that lasted over 50 years. Despite his versatility, Ford was best known for playing ordinary men in unusual circumstances. Born Gwyllyn Samuel Newton Ford at Jeffrey Hale Hospital in Quebec City, Ford was the son of Anglo-Quebecers Hannah Wood Mitchell and Newton Ford, a railway conductor. Through his father, Ford was a great-nephew of Canada’s first Prime Minister, Sir John A. Macdonald. Ford moved to Santa Monica, California, with his family at the age of eight. He became a naturalized citizen of the United States in 1939. After Ford graduated from Santa Monica High School, he began working in small theatre groups. While in high school, he took odd jobs including working for Will Rogers who taught him horsemanship. Ford later commented that his railroad executive father had no objection to his growing interest in acting, but told him, “It’s all right for you to try to act, if you learn something else first. Be able to take a car apart and put it together. Be able to build a house, every bit of it. Then you’ll always have something.” Ford heeded the advice and during the 1950s, when he was one of Hollywood’s most popular actors, he regularly worked on plumbing, wiring, and air conditioning at home. At times, he worked as a roofer and installer of plate-glass windows. Ford acted in West Coast stage companies before joining Columbia Pictures in 1939. His stage name came from his father’s hometown of Glenford, Alberta. His first major movie part was in the 1939 film, Heaven with a Barbed Wire Fence. Ford interrupted his film career to volunteer for duty in World War II with the United States Marine Corps Reserve on December 13, 1942. He was assigned in March 1943 to active duty at the Marine Corps Base in San Diego. He was sent to Marine Corps Schools Detachment (Photographic Section) in Quantico, Virginia, three months later, with orders as a motion-picture production technician. Promoted to sergeant, Ford returned to the San Diego base in February 1944 and was next assigned to the radio section of the Public Relations Office, Headquarters Company, Base Headquarters Battalion. There he staged and broadcast the radio program Halls of Montezuma. Ford was honorably discharged from the Marines on December 7, 1944, for duodenal ulcers that had him hospitalized for several months. In 1958, Ford joined the U.S. Naval Reserve and was commissioned as a lieutenant commander and made a public affairs officer – a position he had portrayed the previous year in the comedy Don’t Go Near the Water. During his annual training tours, he promoted the Navy through radio and television broadcasts, personal appearances, and documentary films. He was promoted to commander in 1963, and captain in 1968. Ford went to Vietnam in 1967 for a month’s tour of duty as a location scout for combat scenes in a training film entitled Global Marine. He traveled with a combat camera crew from the demilitarized zone south to the Mekong Delta. For his service in Vietnam, the Navy awarded him a Navy Commendation Medal. His World War II decorations are as follows: American Campaign Medal, Asiatic-Pacific Campaign Medal, World War II Victory Medal, Rifle Marksman Badge, and the US Marine Corps Reserve Medal. He retired from the Naval Reserve in the 1970s at the rank of captain. Following military service, Ford’s breakthrough role was in 1946, starring alongside Rita Hayworth in the noir classic Gilda. The New York Times movie reviewer Bosley Crowther praised Ford’s “stamina and poise in a thankless role” despite the movie’s poor direction. 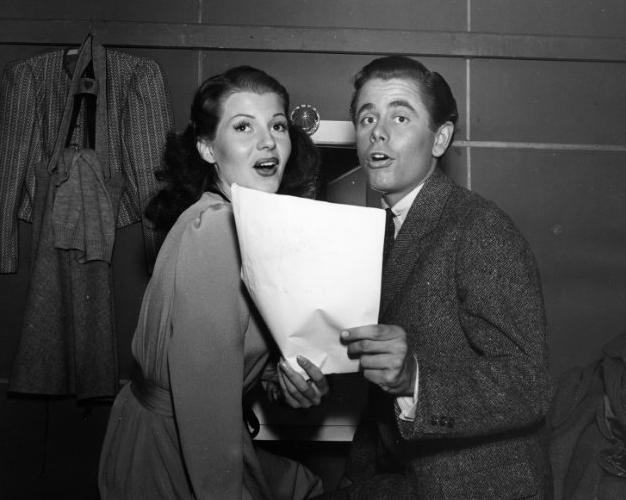 He went on to be a leading man opposite Hayworth in a total of five films. Ford’s film career flourished in the 1950s and 1960s and continued into the 1980s with many television roles. His major roles in thrillers, dramas and action films include A Stolen Life with Bette Davis, The Secret of Convict Lake with Gene Tierney, The Big Heat, Blackboard Jungle, Framed, and Interrupted Melody with Eleanor Parker, Experiment in Terror with Lee Remick, Don’t Go Near The Water with Gia Scala, Four Horsemen of the Apocalypse and westerns such as Jubal, The Fastest Gun Alive, 3:10 to Yuma and Cimarron. Ford’s versatility also allowed him to star in a number of popular comedies, such as The Teahouse of the August Moon, Don’t Go Near the Water, The Gazebo, Cry for Happy and The Courtship of Eddie’s Father. In 1971, Ford signed with CBS to star in his first television series, a half hour comedy/drama titled The Glenn Ford Show. 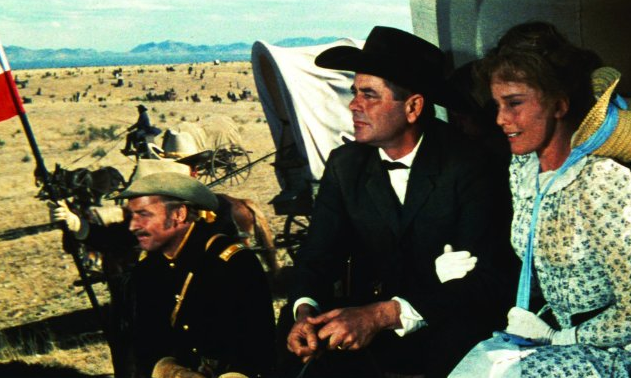 However, CBS head Fred Silverman noticed that many of the featured films being shown at a Glenn Ford film festival were westerns. He suggested doing a western series instead, which resulted in the “modern day western” series, Cade’s County. Ford played southwestern Sheriff Cade for one season (1971–1972) in a mix of police mystery and western drama. In The Family Holvak (1975–1976), Ford portrayed a depression era preacher in a family drama, reprising the same character he had played in the TV film, The Greatest Gift. 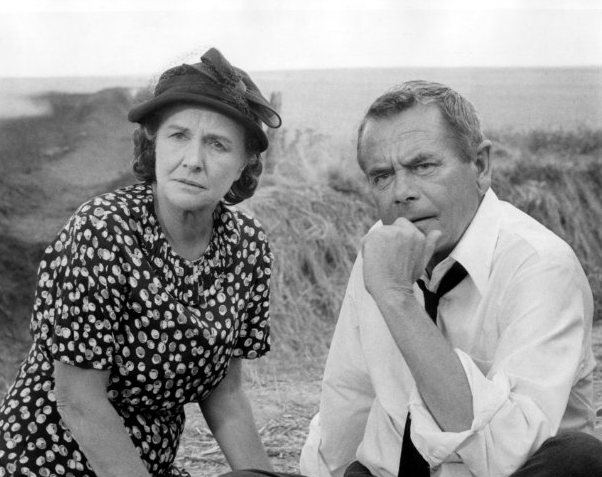 In 1978, Ford had a supporting role in Superman, as Clark Kent’s adoptive father, Jonathan Kent, a role that introduced Ford to a new generation of film audiences. 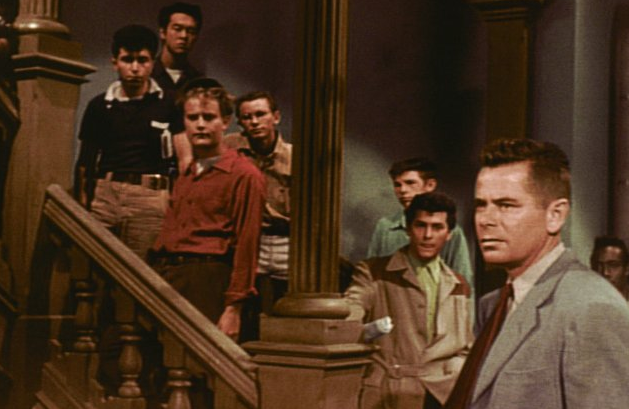 In Ford’s final scene in the film, the theme song from Blackboard Jungle, “Rock Around the Clock,” is heard on a car radio. In 1991, Ford agreed to star in a cable network series, African Skies. However, prior to the start of the series, he developed blood clots in his legs which required a lengthy stay in Cedars-Sinai Medical Center. Eventually he recovered, but at one time his situation was so severe that he was listed in critical condition. Ford was forced to drop out of the series and was replaced by Robert Mitchum. The 2006 movie Superman Returns includes a scene where Ma Kent (played by Eva Marie Saint) stands next to the living room mantel after Superman returns from his quest to find remnants of Krypton. On that mantel is a picture of Glenn Ford as Pa Kent. Ford’s first wife was actress and dancer Eleanor Powell (1943–1959), with whom he had his only child, Peter (born 1945). 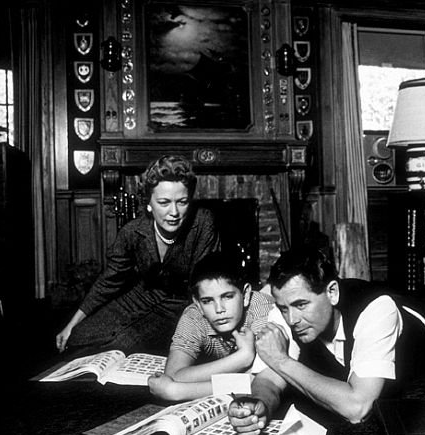 The couple appeared together on screen just once, in a short subject produced in the 1950s entitled Have Faith in Our Children. When they married, Powell was more famous than Ford. Ford subsequently married actress Kathryn Hays (1966–1969), Cynthia Hayward (1977–1984), and Jeanne Baus (1993–1994). All four marriages ended in divorce. Ford was not on good terms with his ex-wives, except for Cynthia Hayward with whom he remained close until his death. 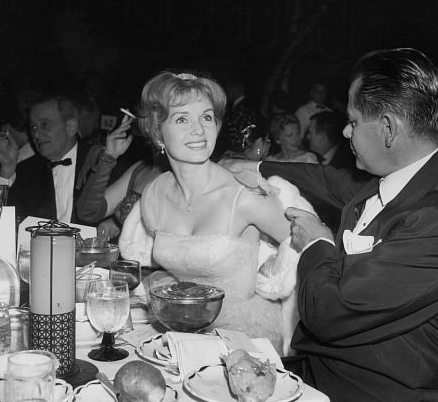 He also had a long-term relationship with actress Hope Lange in the early 1960s, although they never married. 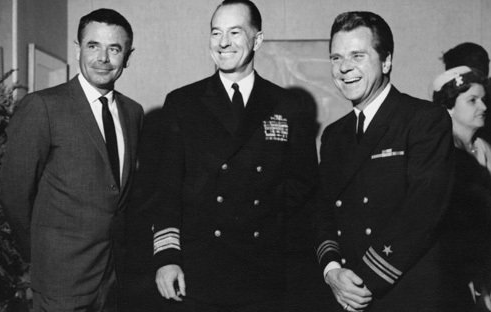 For the first half of his life, Glenn Ford supported the U.S. Democratic Party – in the 1950s he supported Adlai Stevenson for President – and in later years became a supporter of the Republican Party, campaigning for his friend Ronald Reagan in the 1980 and 1984 presidential elections. Ford attempted to purchase the Atlanta Flames in May 1980 with the intention of keeping the team in the city. He was prepared to match a $14 million offer made by Byron and Daryl Seaman, but was outbid by an investment group led by Nelson Skalbania and included the Seaman brothers which acquired the franchise for $16 million on May 23 and eventually moved it to Calgary. Ford lived in Beverly Hills, California, where he illegally raised 140 leghorn chickens, until he was stopped by the Beverly Hills Police Department. After being nominated in 1957 and 1958, in 1962, Ford won a Golden Globe Award as Best Actor for his performance in Frank Capra’s Pocketful of Miracles. He was listed in Quigley’s Annual List of Top Ten Box Office Champions in 1956, 1958, and 1959, topping the list at number one in 1958. For his contribution to the motion picture industry, Ford has a star on the Hollywood Walk of Fame at 6933 Hollywood Blvd. In 1978, he was inducted into the Western Performers Hall of Fame at the National Cowboy & Western Heritage Museum in Oklahoma City, Oklahoma. In 1987 he received the Donostia Award in the San Sebastian International Film Festival, and in 1992 he was awarded the Légion d’honneur medal for his actions in the Second World War. Ford was scheduled to make his first public appearance in 15 years at a 90th birthday tribute gala in his honor hosted by the American Cinematheque at Grauman’s Egyptian Theatre in Hollywood on May 1, 2006, but at the last minute, he had to bow out. Anticipating that his health might prevent his attendance, Ford had the previous week recorded a special filmed message for the audience, which was screened after a series of in-person tributes from friends including Martin Landau, Shirley Jones, Jamie, Farr and Debbie Reynolds.